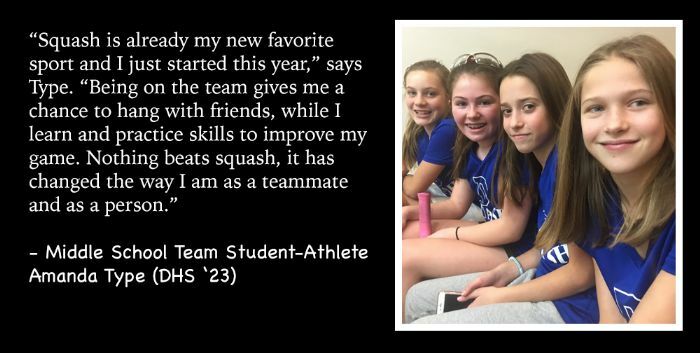 We are a group of Darien student-athletes (grades K-12) interested in learning and competing in junior level squash. Darien Squash leadership is composed of parent volunteers interested in organizing and facilitating the efforts of the athletes. All coaching and training are provided by outside professional programs. Local, regional and national competitions will allow the athletes to compete with athletes from other programs. Darien Squash aims to challenge its athletes with continual instruction in a fun and active environment with the best interests of the athletes as the first consideration. The safety the athletes is our primary concern. The potential for injury is inherent in all sports. Even with the best coaching, the most advanced protective equipment, and a strict observance of rules, injuries can happen. Although serious injuries are not common in supervised athletic programs, it is impossible to eliminate the risk. Parents and students must be willing to accept the risks associated with sports participation. As in all competitive sports, good sportsmanship is to be adhered to by all players during clinics and matches. Good sportsmanship is a learned behavior and will be reinforced by the coaches and DMS Squash leadership. Parents can play a great part in having their children practice good sportsmanship by being positive role models. Squash is a sport that takes place within an enclosed court. All behavior is in plain sight of coaches, fans, and other players. The DMS Squash Team is part of he FairWest Squash League which includes ~10 schools and ~400 players in the Fairfield-Westchester area. The FairWest League looks to grow their numbers, and provide a place for players of all levels—whether those who are top-ranked Gold/JCT competitors or just beginners—including private and public school students, to play and get better at squash. It is an outlet for squash players, who may not have the best team programs at their schools, to play more often and with other kids of their same level, or better. US Squash is a 501(c)3 nonprofit organization which serves as the only national governing body and membership organization for the sport in the United States. Founded in 1904 and headquartered in New York City, it is a member of the U.S. Olympic Committee, the Pan American Squash Federation and the World Squash Federation. As a member of the Darien Middle School Squash Team, you will: (1) need a US Squash membership, and (2) need to complete the Referee Exam. Accredited Tournaments: US Squash accredits and supports a year-long calendar of tournaments throughout the country. Tournaments are structured into several levels and types, each designed to offer competitive opportunities for all ages and levels of play.